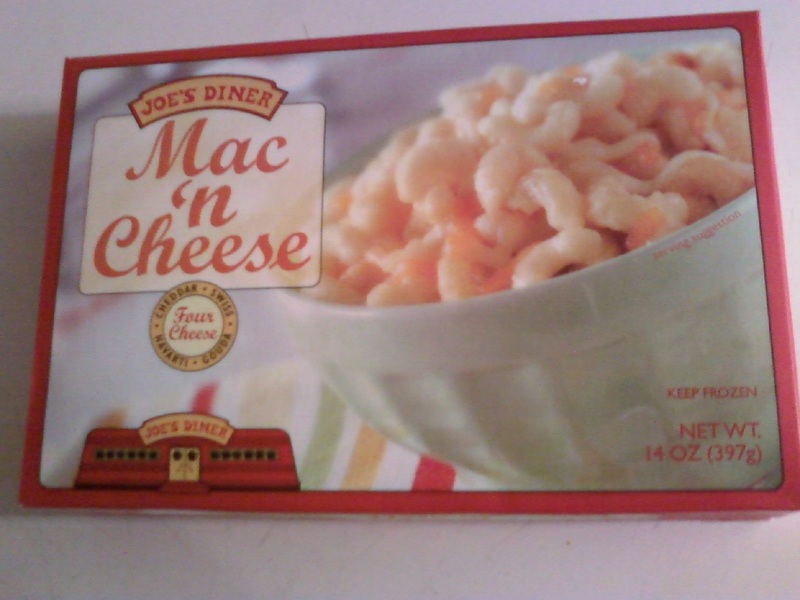 Trader Joe's Macaroni and Cheese is part of a line of diner-style dishes called "Joe's Diner." The way it's packaged, it works best as a side dish for two or more, rather than an entree for one person. It's not bad, but it's not stellar. Sonia seems to be a bigger fan of it than I am. In general, the most common issue I have with TJ's brand foods is that they can be bland. Very few foods have nasty textures or bad tastes, but a minority of their products simply lack flavor. This mac n' cheese is not the worst offender, but I would place it in that camp of slightly bland foods. However, salt, pepper, and/or hot sauce can make this dish quite yummy. I would say taste-wise, this mac n' cheese ranks just below Kraft Easy Mac. At $2.99 per package, it's probably a little more expensive than Easy Mac. But of course, the TJ's brand is much better for you. I've tried some experiments mixing the Joe's Diner Mac n' Cheese with the TJ's chili. It's a great combo. All in all, I give it Three out of Five Stars...Sonia gives it Five out of Five Stars. My favorite easy dinner for two (he's a big eater): 2 packages TJ's "Reduced Guilt" Mac & Cheese, 1 pkg regular Mac & Cheese (reviewed above) & 1 pkg TJ's frozen broccoli. Remove all packaging, throw in a casserole & heat in oven according to directions, stir everything around the time it should be done, and heat a few more minutes uncovered until there are some nice burned cheese bits around the edges. I have to respectfully disagree that this ranks below Kraft. While there is a certain nostalgic charm for me to Kraft boxed mac & cheese, the TJ's frozen version is MUCH tastier to my palate. I can see where it would be good with chili... I have been known to add pasta to chili and then stir in ample amounts of cheddar cheese to make chili-mac, so same basic idea. Btw, I am currently a big fan of the TJ's Shells & White Cheddar boxed mix mac & cheese. So good. But too fatty for me. I always get the diet version which still tastes amazing, it's just smaller portion wise and with a little less butter. Or oil. Or whatever it is they put in it that does that. I'm eating my first box right now. I meant to save half as a quick lunch or dinner side tomorrow but I couldn't stop. I ate the whole thing. I don't even care. I didn't even get the guilt free version. Guilt be damned. This mac and cheese is delicious. This is WAY better than Kraft, hands down! The combo of cheeses melts perfectly to add other things to it such as ham and/or broccoli. The best way to eat this, IMO, is to put a few packages in a crock pot and add some fried onions on top, heating until the edges get a little crunchy/brown. It disappears within minutes at a party! You are insane, this is the very best Mac n cheese you can buy at a store, period. Anywhere.